Through the centuries, fasting became such an important tradition in the Jewish religion that it was given the force of law. The Jews had many traditions that involved afflicting the flesh that were not commands of God, but which they kept as if they were. Many such traditions are mentioned in ancient Jewish literature, but not in the Bible. Some are in the Bible and even a cursory reading of the Gospels shows Jesus in conflict with the Jews about traditions that made people’s lives difficult, including Sabbath traditions (Matt. 12:10–12), traditions about helping parents (Matt. 15:3–6), and traditions involving cleanliness (Mark 7:1–6). Jesus also did not require his disciples to fast, something that confused the people of his time (Mark 2:18–20). Even though fasting was a tradition, not a commandment, it was an important part of the Jewish religion and was also practiced by the early Christians so it is mentioned many times in the Bible. For example, Zechariah mentions a public fast in the fourth, fifth, seventh, and tenth month (Zech. 8:19); Jesus mentions fasting in the Sermon on the Mount (Matt. 6:16–18); the Day of Atonement is called the “Fast” (Acts 27:9); and the early Christians fasted (Acts 13:1–3). Fausset’s Bible Dictionary notes in its article on fasting (now Public Domain in Bibleworks®) that fasting was not part of the Law of Moses. On the yearly Day of Atonement, the 10th day of the 7th month, Israelites were directed to “afflict the soul” (Lev. 16:29–31, 23:27; Num. 30:13 [all KJV]). This significant term implies that the essence of scriptural “fasting” lies in self-humiliation and penitence, and that the precise mode of subduing the flesh to the spirit, and of expressing sorrow for sin, is left to the conscientious discretion of each person. The Day of Atonement was a day for people to “afflict your souls” (Lev. 16:29 and 31 – KJV), which other versions translate as “deny yourselves” (NIV), or “humble your souls” (NASB). The Hebrew word that the KJV translates “afflict” in Leviticus 16:29 and 31 means to “humble, overpower, subdue, oppress, or weaken,” depending on the context. The same Hebrew phrase occurs in the context of a woman making a vow to afflict her soul, which could be any vow she made that involved self-denial (Num. 30:13). Although over time the Day of Atonement became a day of fasting, God never specifically said people were to go without eating. Instead, people were to deny themselves, which different people would do in different ways. It is important to be aware of the three verses where “fasting” was added to some of the Greek manuscripts, eventually finding their way into both Protestant and Roman Catholic Bibles, especially the earlier versions such as the King James Version, Geneva Bible, or Douay-Rheims. We will show each of them in both the KJV and a more modern version that recognizes the erroneous addition. For our modern version we will use the ESV (English Standard Version), which is the newest, widely accepted, essentially literal translation available today, although we would find the same thing in the vast majority of Protestant and Roman Catholic modern Bibles. Verse 21 does not even occur in the ESV, because the research done in the almost 400 years between the King James Version (1611) and the ESV (2001) to recover how the original Greek text reads shows that the whole verse in the KJV had been added by scribes to make Matthew more closely harmonize with Mark. In fact, the ESV does not even have a verse reference for verse 21, so, unless a reader pays attention to the numbered verse order as he reads, he would not notice that verse 21 is not there. We have seen that fasting was a man-made tradition that over time was given the force of a law. Another reason Christians fast by going without food is that we have a tendency to want to save ourselves by our works or gain the favor of God by what we do, and we think fasting gets God’s attention and demonstrates our love for Him. God does show favor to those who humble themselves before Him, as James 4:6 says: “…God opposes the proud but gives grace to the humble.” However, we must keep in mind that no verse of Scripture says that going without food is the kind of humility God wants from us. What God wants is what He has always wanted, that we deny ourselves in order to benefit others. Isaiah 58 is a wonderful chapter about “fasting,” which contrasts pompous and pious fasting, which is just a show of the flesh, with the true fasting God expects from us. A careful study of the chapter shows that the people God was addressing were trying to look religious in the flesh, but were actually rebellious and sinful. God says to Isaiah, “…Declare to my people their rebellion and to the house of Jacob their sins” (Isa. 58:1). The fleshly and hypocritical actions of the Israelites did not fool God, so He paid no attention to their fasting. God always looks on the heart and does not respond to hypocritical actions, no matter how pious they look. Then comes a part of Isaiah 58 that we must pay special attention to because God speaks of the kind of “fast” that He expects from people and how He will bless us if we do good to others from the heart instead of making a prideful show in the flesh. Through the prophet Isaiah, God tried to bring people back to what they should have learned from the Day of Atonement, that true “fasting” is not going without food, but denying ourselves by helping and serving others. This truth is taught again in Zechariah, in whose time the people had fasted regularly and yet had many troubles. They sent to the priests and asked about their fasting and were given the same kind of direction Isaiah had given: fasting was not refraining from food, but extending yourself for the sake of others. These verses from Isaiah and Zechariah are the Old Testament equivalent of what Jesus spoke about when he said that anyone who wanted to follow him must deny himself (Luke 9:23), or when James said that pure and faultless religion is to look after orphans and widows in their distress and to keep oneself from being polluted by the world (James 1:27). True humility is a matter of the heart and is reflected in service to others. In spite of the fact that fasting in the sense of going without food was not a command of God, Jewish tradition had given it such emphasis that most people considered it law. That is why in the Sermon on the Mount Jesus said, “When you fast….” He was not commanding fasting, but acknowledging the common practice of the day. However, we can tell from what Jesus said that the religious leaders of his time were no different from those of Isaiah’s or Zechariah’s time; they were fasting to openly flaunt how spiritual they were and how much they loved God. In contrast, Jesus taught us that if we are going to fast, it is a private matter between God and us and should not be made public. If going without food were necessary for our spiritual life, God or Jesus would have said so, but they did not. We do not have to go without food to obey God, but He does want us to “fast” by denying ourselves, like the Law, Prophets, and New Testament teach. If we go without food to try to get close to God while ignoring what He told us to do to get close to Him, we become like the Pharisees who rejected His commands and replaced them with their traditions (Matt. 15:1–3; Mark 7:5–9). To put the practice of going without food in perspective, however, it will help if we realize that the Middle Eastern people had a number of customs besides fasting by which they demonstrated the humble or distressed posture of their heart and that they were in need. One was to tear their clothes (Gen. 37:29 and 34, 44:13; Num. 14:6; Josh. 7:6; Judg. 11:35; 1 Kings 21:27; Isa. 37:1). Another was to wear clothing made of “sackcloth,” a very rough and uncomfortable fabric that would be similar to our wearing clothing made out of burlap (Gen. 37:34; 1 Kings 21:27; 2 Kings 6:30; Esther 4:1; Isa. 37:1; Lam. 2:10). Another way was to sit in ashes or put ashes on themselves (2 Sam. 13:19; Esther 4:1 and 3; Job 2:8, 42:6; Isa. 58:5; Dan. 9:3). Still another way was to put dust on their heads (Josh. 7:6; Job 2:12; Lam. 2:10; Ezek. 27:30; Rev. 18:19). God did not command any of these outward shows of humility and need and none of these practices are essential for getting His attention, but neither are they forbidden. Anything we do to genuinely humble ourselves before God, subdue the power that our bodies and sin nature have over us, and increase our love for God and mankind, is fine with Him. Nevertheless, we should be sure that we “fast” the way God wants us to first and only then fast or show our humility in other ways. It we do choose to fast by going without food, it is important that we never consider it as a form of self-punishment for our sins. Jesus took on our punishment and the chastisement of our peace was upon him. If God wanted us to punish ourselves for our sin, He would have made that perfectly clear. We all sin and God has told us what to do in those cases: confess it and ask forgiveness (1 John 1:9). The Bible has examples of people fasting after they have sinned, but there is no reason to think they did so as a punishment, but rather to have time to focus on repentance and their walk with God (1 Sam. 7:6). We live in a very self-centered culture and our sin nature is relentlessly selfish. One way many people have become less self-centered and more Christ-centered, helped themselves focus on a petition before God, or helped themselves break the control that their fleshly desires had over them, was to fast. Many great men and women of the Bible fasted when they needed God’s help (2 Sam. 12:16; 2 Chron. 20:3; Ezra 8:21-23; Neh. 1:4; Esther 4:16), and Jesus himself fasted in the desert for 40 days (Matt. 4:2). In each of these cases, fasting was something that the individual felt was important for his spiritual life and successful walk with God, and we must realize that as it helped them, it may possibly help us. 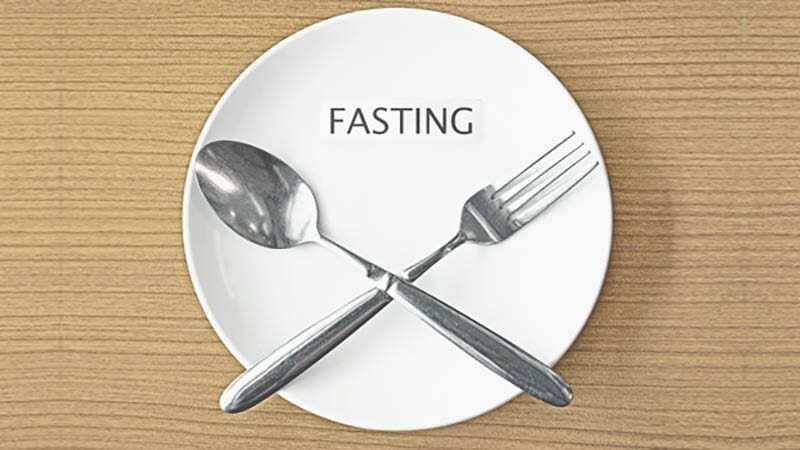 There are several common ways people practice fasting. One way is to go entirely without food. Another way is to fast from something that seems to have a control over us. For example, a person who craves chocolate may “fast” by giving it up for a period of time. We can even “fast” from non-food things that seem to have too much influence on us, such as watching television, listening to a certain type of music, or sleeping late. These can be very effective ways to deny ourselves. There are many things we can give up for a while to help us focus on a petition before God, gain confidence that a request will be answered, or even just give us confidence that our flesh does not control our life. What we learn by studying fasting in the Word of God flows in perfect harmony with what we know about God. No pious outward show we make in our flesh impresses God for He looks on our heart. It is God’s desire that each of us learn to deny ourselves and serve others. In our efforts to live a life of service, it may be helpful to fast. If we do choose to do so, we must do it like Jesus taught us: as a private matter between God and us and not as a display to others. Our goal is to be pleasing to God and helpful to others, which requires denying ourselves, which is the same instruction God gave us on the Day of Atonement.